A roving exhibit designed to introduce neighbors and highlight growth and change. To highlight the growth and progress that is occurring in the South End Business District, the owner of 200 Market approached Think Joule to design a “Meet Our New Neighbors” roving exhibit. Our task was to design a compelling and visually impactful traveling exhibition showcasing key projects happening in the neighborhood. 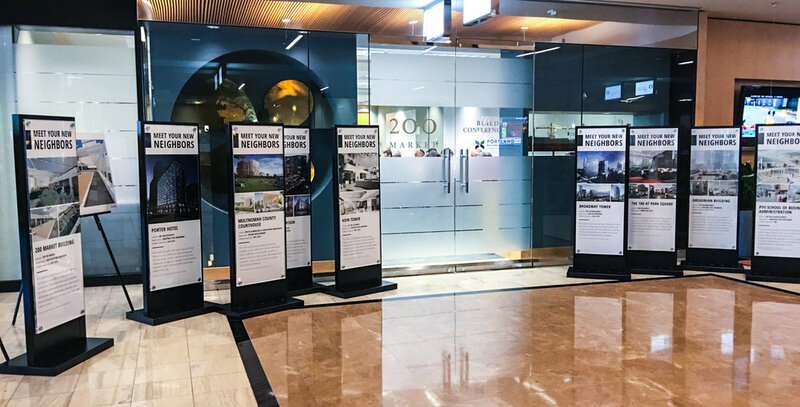 Our task was to research and gather assets for nine active building projects and explore the best medium for displaying the mobile lobby exhibit. The final solution had to be visually sophisticated—as to adorn Class A lobby space, and take into consideration the limitations of diverse spaces, mobility, durability and size. We offered 3 tiers of design solutions and the owners selected the top of the line custom built metal acrylic display. The result is a visually arresting representation of the growth in the South End that has made its way across various Class A lobbies in the area as a temporary display.